When Will Jimmie Johnson Get His Due? 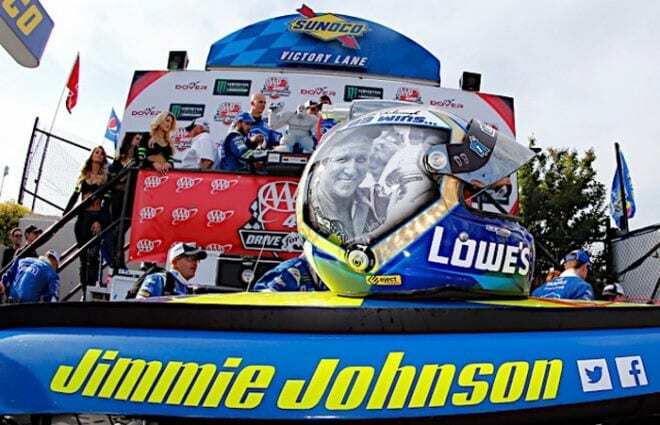 Home / Bowles-Eye View / When Will Jimmie Johnson Get His Due? As the sun beamed down on Dover International Speedway, car owner Rick Hendrick was still taking it all in. Driver Jimmie Johnson had snatched a victory, his record 11th at the Monster Mile, right out of a dominant Kyle Larson’s hands and no one on his own team believed it. 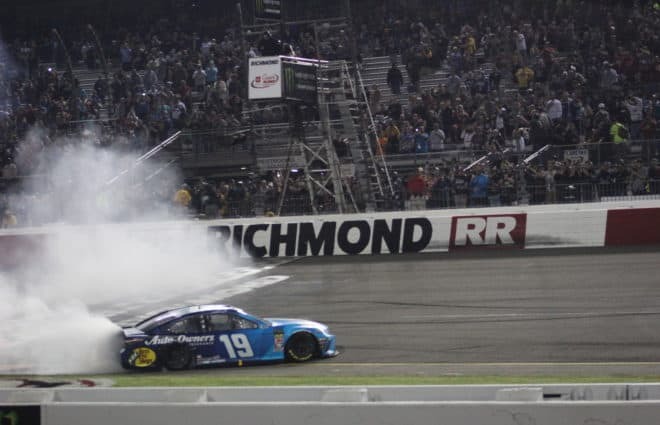 Crew chief Chad Knaus found the ending improbable enough he kept Johnson superglued to the pace car’s bumper “just in case.” His jump to the front in NASCAR Overtime completed a miracle drive from worst to first even though it took six extra laps to do it. It was an ending which had Larson referring to that “golden horseshoe” Kevin Harvick claims Johnson has hidden somewhere. So the question came, as it inevitably has so many times before. 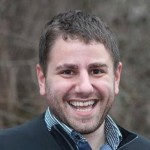 What is the balance between Johnson’s luck and skill? “I don’t think you can be lucky 83 times and seven championships,” Hendrick said without hesitation. “I think you have to have some racing luck every now and then. You get one that maybe someone fumbled the ball. Sunday was clearly one of the fumbles. Johnson had to be lucky to be in position to win, the beneficiary of a late caution flag that occurred in the middle of green-flag pit stops. He still needed another late yellow, one for David Ragan’s wreck, otherwise the No. 48 car would finish second to Larson. On top of that, Larson spun his tires on the restart. It was a moment the youngster initially complained about on the radio but by the time the checkered flag had waved, cooler heads prevailed. The duo then edged past the NASCAR Overtime line mere seconds before Ty Dillon ended up in the wall. Just like that, the race was over and Johnson somehow found his way into Victory Lane. It’s the type of racing luck that brings the Jimmie Haters out in force. 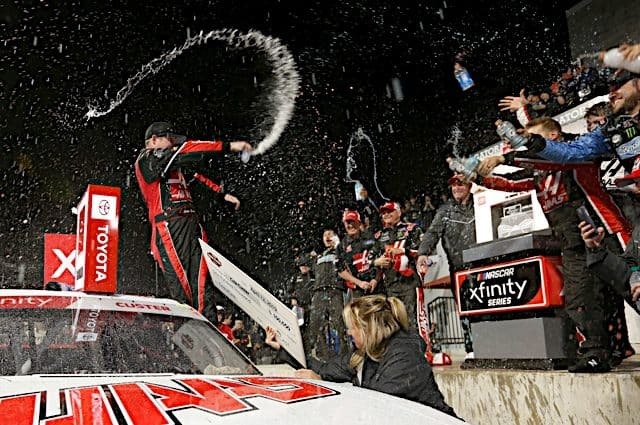 On social media and elsewhere, NASCAR officials were decried for throwing the caution too late, creating the NASCAR Overtime rules and handing victory to the No. 48. Sure, Larson spun the tires but Johnson also maximized his opportunity. He was clearly in front past the NASCAR Overtime line and would have made it to the white flag in first. You can’t fault the No. 48 team for executing a pit strategy that worked perfectly. It gave them track position during a late caution and set them up for a potential win. Champions make their own luck, right? It’s a formula Johnson has followed, time and again to the point he’s in rarified air. 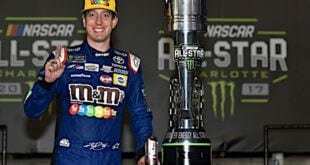 The 83rd career victory tied him with Cale Yarborough, a NASCAR Hall of Famer for sixth on the all-time list, who also happened to be a childhood favorite. It’s also the next step up the ladder to NASCAR immortality. Two more wins and Johnson will blow by Bobby Allison and Darrell Waltrip for fourth on the all-time list. 10 more and he’s passed former teammate Jeff Gordon for third. 23 more, a very reachable number considering his win rate the past few years and he’ll pass David Pearson and sit runner-up to The King. 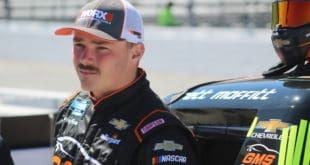 It’s possible, by then Johnson will be the new King with a record-breaking eighth NASCAR championship. But yet here we are, talking about the right balance of luck and skill. LeBron James is in his seventh straight NBA Finals. I watched his post-race press conference Sunday night. You think people are asking him about the difference between luck and skill? No. People are wondering if he’s the greatest of our time. You wonder if Johnson will ever get that same level of respect while driving. He could win 10 straight races, it seems, and the world will jump on a conspiracy theory. Every victory is scrutinized for a potential holding call NASCAR threw to keep the opposition at bay. It’s Johnson’s world, created by the sport’s puppeteers, and everyone else has to run on seven cylinders. God forbid there’s any actual talent involved that produced 11 Monster Mile wins and over 3,000 laps led. NASCAR produced a handout Sunday that showed a career comparison between Johnson and Yarborough. The seven-time champ got his 83 wins in four fewer starts; he also has more top-10 finishes than Cale, four more titles and a higher average finish (12.1 to 12.6). He’s done so in an era with a higher portion of the field capable of winning and a potpourri of postseason formats. Yes, I know, comparing any era of NASCAR drivers has a level of apples to oranges involved. But it’s clear Johnson can hold his own against virtually any Hall of Famer you throw up against him. Pearson, Allison, Waltrip… Johnson’s right on pace. So why are we treating every win as if it’s been stolen by a second-class citizen? Some say it’ll take retirement for Johnson to be fully appreciated. That he’s too intertwined with vanilla personalities, Hendrick dominance and other factors which contributed to the sport’s decline these last 10 years. But it really shouldn’t be that way. Perhaps one day, people will start appreciating the man instead of nitpicking his every move. Next Up to Speed: How Much Will Kyle Larson’s Near-Misses Matter? 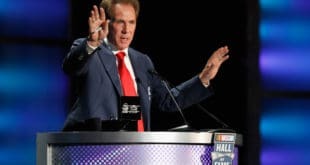 Winning a race early in the season, cruising the rest of the regular season races because you are locked into the “playoffs”, then win the 10 race championship just doesn’t scream “legend” to me and I cannot respect a 10 race champion, no matter how many times its done. He has never won a full season championship. It always comes back to how many championship would he have won if it was still under the full season format. My guess is far less than he has now. Other than the win totals, the 10 race championships don’t impress me. And even then, the win total rings hollow for me because 95% of them came in the ‘welfare era’ of lucky dogs, wave-arounds, and selective debris cautions that only seem to fly if certain people are in jeopardy….how many times have we seen Johnson win in the fashion that he did this past Sunday? Too many times to ignore, for me. 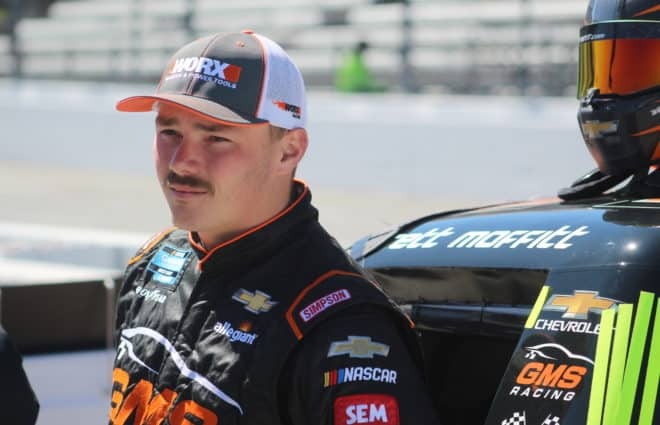 And like somebody else stated, I can’t remember Johnson ever having a real race with anybody (except with Gordon, at Martinsville in 2007 and Atlanta in 2011). His car is either so dominant no one can touch him or a sh**storm involving everybody but him ends up putting him in contention when he otherwise had no shot (see: Homestead 2016). Is he a massively talented driver? Without question. Are his stats inflated because of BS circumstances? Absolutely. These guys who he’s rivaling in the all-time wins department would eat him alive in a head-to-head battle in their prime. THEY all liked a good race, Jimmie does NOT…. His COVETED BS win at Homestead was one of those instances you mentioned. He was a non factor most of the race, his racing season, meh. Carl drives down on Logano, and JIMMIE is declared with the greats with 10 laps to go out of a “meh” season, because the other two were getting it done, had a incident. And they wonder why people PFFFTT, Jimmie? His whole career seems to be a puzzle of having the longest pit stops for something or another, and he is always STILL SCORED on the lead laps. He is back in trailer park view and a series of cautions get him up front, PEPPY DEBRIS is a YUGE fan of YIMMIE!. Doesn’t help that Chadly has never had any serious atonement’s for his sins, when others have be hung on the cross for far less. I dunno, call me bewildered, I have never seen JJ actually RACING ANYBODY!~~~~~~So I truly don’t get this ‘WHEELMAN” BS that is thrust upon him, I just don’t get it. I can’t recall him mixing it up with anybody, his skill seems to be taking advantage of those debris cautions that NASCAR is so fond of. I just don’t get Jimmie Johnson THE SKILLED FEARED RACER…I never saw it, don’t get it. What moves? I can’t think of a one…..I know he whines a lot, as all HMS drivers do..DON’T RACE ME, DON’T RACE me. But I gotta say, it is NOT THRILLING WATCHING HIM DO A DAMN THING, he has this weirdness of blandness of nothingness. IMO. And a yuge amount of help from NASCAR..Him and CHADLY are blessed with the HORSESHOE HARVICK NOT LARSON have spoke about! I get no thrill at all watching him do anything, nothing zip, nada. Yawn. I know it sounds dumb, but I don’t recall him mixing it up with anyone..a actual racer…no, I don’t get it. I think the lack of respect is a combination of several factors… the fact that his only crew chief is considerd to be the best in the business and has a history of rules violations; the hated chase format; and the fact that his car owner isn’t really respected by by a lot of race fans. I’m certainly not saying those things are all true, just that they play a part in why Johnson’s detractors are so numerous. 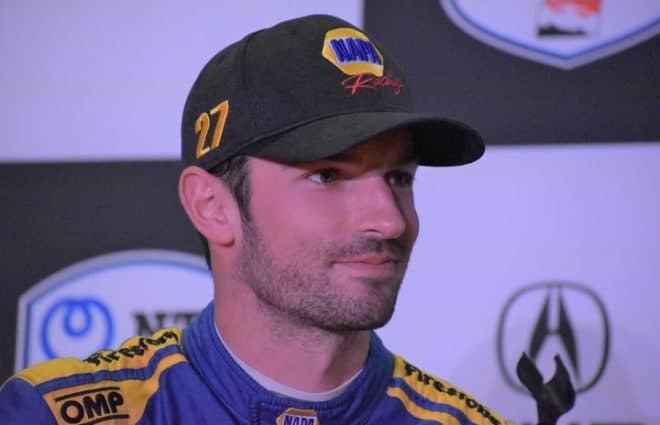 I suspect a lot of race fans are like me… can’t stand to see him win, but recognize that he’s a seven-time champ for more reason’s than just Chad Knauss, and now that I’ve said it, take note because I’ll never say it again. There are too many “what if” questions. For me the biggest is what if he drove for someone else? Sissy man will never get respect from me. He only wins because of crew chief or NASCRAP contrived cautions! Don’t leave out cheating Chad, who in the past was responsible for many wins by johnson. Don’t forget the time where hendrick went to the last protest that was run by his buddy and overturned the 2 violations upheld by the 2 lower courts and along comes ricks friend for final say so and the ruling was overturned. Anyone smell rotten fish? Went like this a lot. JJ and Knaus are a formidable team, probably one of the best ever. But, until they have won championships in some format other than the gimmicky playoff, 10 races win-or-die format, it will never feel quite the same as a season long title. That’s just the way it is. Pearson has 105 wins in 574 races and 366 top tens. J-Jo has 83 wins in 556 “races” and 335 top tens. J-Jo needs 22 wins in 18 events to catch Pearson. Brian’s working on it. How many dirt races has seven time won? When J-Jo can build his own Cup car, take it to a track on a one car trailer, set it up and win I might change my mind. Conspiracy theories or not, until he does something in another car, he’s not even in the conversation of being on the level of Pearson, Allison, Yarborough, etc. I and others are with you on that. How would he do in the 23 or 38? Would he bring out the same cautions to help another Hendrick car? And the same applies to Gordon (Jeff not Robby or Cecil). How would he have done in another owner’s car? When J-Jo stops getting the late race cautions that give a last shot at the win. How many is this now? When he got to within a half second and less of Larson and then backed off I had a feeling of impending disaster for Larson. Sure enough the 38 did his job. This is getting REALLY old. J-Jo should hit 100 wins by the end of the year. It would be silly to think that NASCAR threw the caution flag late to hand Johnson the win. They did in fact throw the caution flag late though. FOX likely insisted. That final wreck would have taken awhile to clean up and there’s no telling if there would have been more cautions on subsequent GWC restarts. FOX had already gone over thier time slot and run into the bloc slated for NHRA coverage. They were sitting ion all sorts of violent fiery engine explosion footage they couldn’t wait to air. I was particularly amused by the usual “synched” shot of the pack and the isolated camera intended to show when the yellow light came on. FOX of course could dub that yellow light at any point they chose since there’s no time stamp on the film, yet the first time they tried they missed. FOX has done its part in messing up this country and they’re gunning for our sport as well. And how are we supposed to compete with graphic footage of Courtney Force exploding her funny car in half? You’ve got it all, an ultra-hot blonde driver, fire, explosions, speed…..but no Monster “Girls”. NASCAR still has that. “Fox has done its part in messing up this country”? Please explain, Matt. Unless you want to turn this into a nasty political debate (which you can find plenty of everywhere else on the internet) then please don’t explain Matt and just let it drop. This is a slippery slope and it won’t be pretty if that can of worms is opened. I promise. Agree that Fox had a hand in the finish.Like you say they were behind schedule and didn’t need a slew of restarts. Hell , it was “A Jimmie Johnson Love Fest at Dover !’ I think out of the 4 or so hours the race was on, they swooned over him for at least 2 1/2 hrs of the race.If they weren”t in a hurry to end the race ,why didn’t the track crews get out there and clean up the speedy dri better than they did? The pace car drove thru it and swerved,Larson went thru it and swerved.If the crews were allowed to clean the track properly,there wouldn’t have been a huge cloud of dust kicked up from all the crap left on the tracxk. 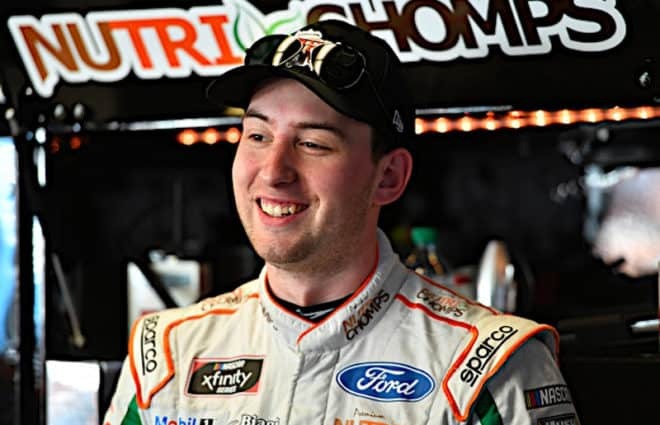 If Kyle was smart and taken the inside ,he still would have lost the race as they would have thrown a caution seeing how jimmie would have spun also. And NA$CAR could not let that happen,not with the “Golden Child so close to winning the race . Yep, he will get his due when he retires. I think many fans look at his career as having been aided immensely by the chase format (especially the 7 championships). Can’t say he isn’t one of the greatest but I associate him so much with the chase (which I hate) that that feeling bleeds over to him.